Upper arm tumour. 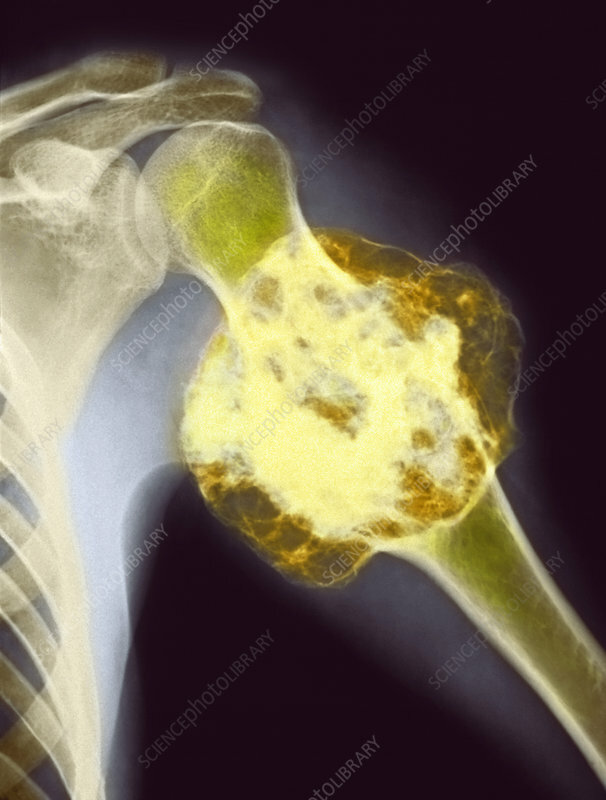 Coloured X-ray of osteochondroma, a benign (non-spreading) tumour of bone and cartilage that has grown on the top part of the upper arm bone or humerus. It occurs most often during the first two decades of life. Typical sites are the long bones of the legs and arms. Although it is not usually a dangerous condition in itself, an osteochondroma may have to be removed if it causes pain or affects mobility. An inherited form with multiple growths, which is called multiple heritable exostoses, may progress to a malignant bone cancer (chondrosarcoma).